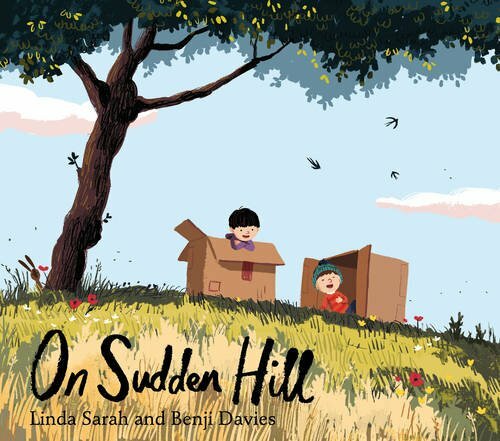 Etho and Birt are best ever friends – kings, pirates, soldiers and astronauts as they share adventures in their cardboard boxes on Sudden Hill. But one day Shu arrives, and although they welcome him into their dragon slaying and skyscraper dances, it all feels very strange to Birt. One night, in anger and loneliness, he smashes up his box and stops going to Sudden Hill. But Etho and Shu haven’t given up on their friend, refusing to let him go as the two-by-two rhythm of his former friendship becomes a three-by-three rhythm with which they are all comfortable. This is a poignant and evocative story of early friendship which is ideal for sharing or for young readers to enjoy alone. The narrative is sparse but effective, as the story is fully told in images. Large, empty vistas form the backdrop for little people with big imaginations to be Big friends and Giant kings. It would be difficult not to be moved by this book. I highly recommend it for nurseries, pre-schools, Key stage one classes and any home inhabited by a young child.